If you’re a parent of a deaf or hard of hearing 5- to 12-year-old working below potential in a general education setting, you’re not alone. One question parents of students who didn’t attend CID often ask is: “My child has made it through preschool, kindergarten and even first grade in regular schools. 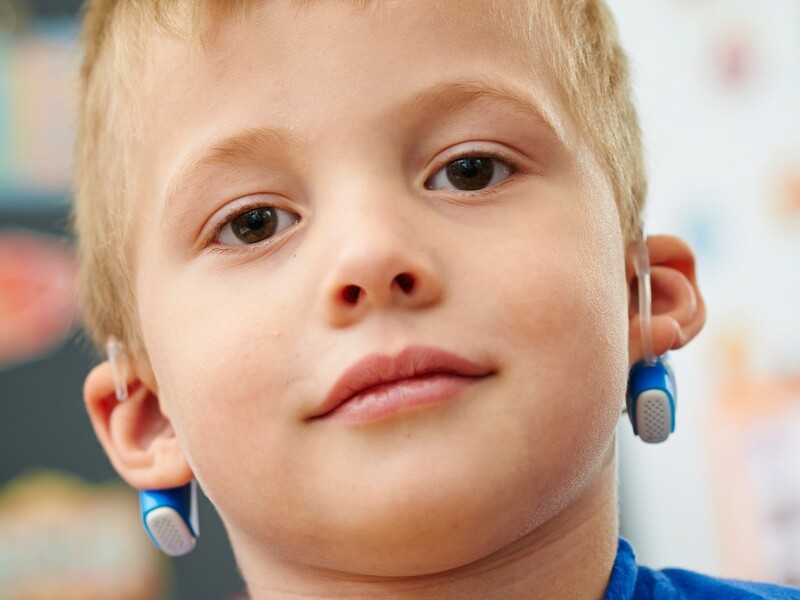 Why is she struggling now?” Most often, this happens as academic subjects become more difficult and the gap between students with typical hearing and students with hearing loss becomes more evident. Just having a cochlear implant or hearing aid and being in class with students who are speaking will not magically teach a child who is deaf or hard of hearing to speak well, read or do math. In the CID Virginia J. Browning Primary School, we group students by ability to maximize progress in every subject and to help each student work to his or her full potential. Our creative and talented teachers are specially trained and have many years of experience helping children who are deaf and hard of hearing learn to talk and develop listening, language and speech along with skills in all academic areas—from reading and literature to math, science and social studies. CID uses much of the same academic curriculum used in general education schools throughout the U.S. We offer a diverse and challenging educational program emphasizing small class sizes, individualized instruction and a hands-on approach to learning. Included in our curriculum are classes and special activities in art, physical education, music, study skills and social skills. Our goal is to educate the whole child. CID teachers, audiologists, speech-language pathologists and occupational therapists are committed to a team approach. Parents are an integral part of the team. Families move to St. Louis so their children can attend, and we do not take this commitment lightly. Wherever you live, if your child is not working to his or her potential and you need help, please call me today or use the GET STARTED link and we will call you. In the CID Virginia J. Browning Primary School, children ages 6 through 12 are are grouped by their abilities and learning needs in each subject area. Ability grouping allows for mastery teaching, high motivation and a successful educational experience. The children are partnered with others with skills similar to their own and work with one or more teachers each day. Daily subjects are language, speech and listening skills, reading, writing, literature, math, science and social studies. Every classroom has a large-screen interactive SMARTBoard along with a teacher trained to use it to enhance learning. The CID primary school is directed by a master coordinating educator who works with the other teachers to continually review and revise each child’s educational program. The teacher-student ratio is better than 1-5. Using tools that include daily language sampling, a speech therapy log, and a speech-language pathologist’s formal assessment of receptive and expressive speech and language, the teachers stay attuned to each child’s skills and pursue precise educational goals. Flexible scheduling and ability grouping enable them to quickly adjust educational objectives and procedures to foster the most possible progress for each child. The children work hard, have fun and experience success. Each time they achieve a new goal, they’re energized to take on the next challenge. Regular special subjects are tailored for each age-group and include physical education, art and music. The students attend a health and growth class with a counselor who is deaf. They regularly go on educational field trips in the St. Louis community. Preparing students for general education schools involves getting them used to homework, giving them greater independence with school-related tasks, and engaging them in discussions about school and social life with typically hearing peers. Family conferences and report cards are part of the process. CID offers a Ready, Set, Go! program for parents of students preparing to enter general education programs. During 90 minutes of language arts, CID primary school students learn reading skills in small ability-based groups. Their phonemic awareness, phonics, vocabulary, reading comprehension and reading fluency improve as they succeed in learning to read. Our literature class provides practice of comprehension skills while appreciating classic children’s stories. CID students enjoy this story time and practice auditory skills while listening to the teacher reading out loud. Daily gym class, or PE, is a student favorite. The children follow a general education physical education curriculum taught by an experienced teacher. Games, gross motor skills, endurance, sportsmanship and fun are all part of the PE curriculum. We offer weekly special activities to develop art, music, library and study and social skills. The children learn from a teacher from the Center for Contemporary Art, as well as from a certified Kindermusic teacher. Our counselor (who is deaf and an excellent role model for the students) teaches them social skills. Throughout the day, CID students have access to laptops, iPads and SmartBoards. Not only is it fun for them to gain experience with computer technology, they receive a well-rounded background similar to that experienced by their typically hearing peers. 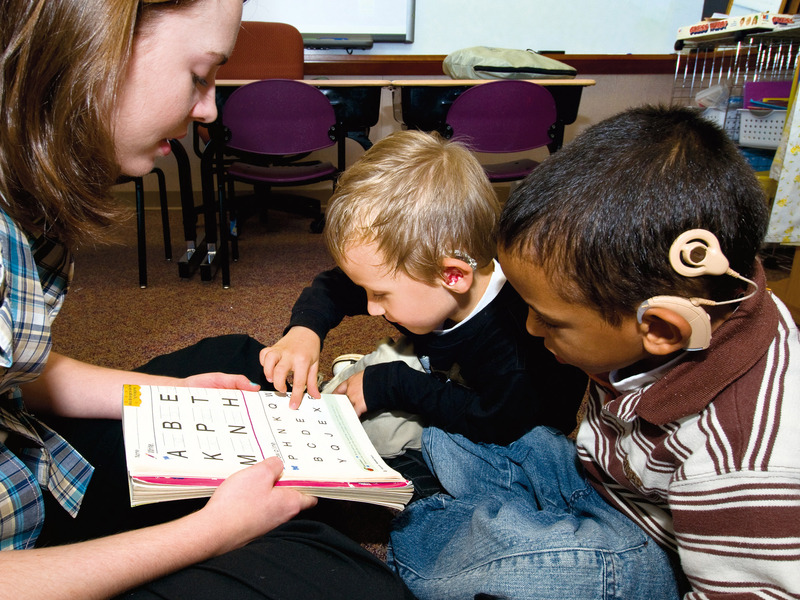 Master-level teachers of the deaf and speech-language pathologists target goals for each individual child to improve his or her speech and listening skills. This takes place in small groups of one or two students. The skills are reinforced throughout the school day. Language instruction at CID is two-fold. We group the students by ability and teach them specific language and grammatical structures. We practice these structures intensely each day. Then, when the students talk about their weekend, learn new academic concepts or participate in pragmatic language activities, we encourage them to converse using their new language skills. This period also enables students to use their best language to practice writing for a variety of purposes. These writing skills are also reinforced throughout the school day. Washington University School of Medicine graduate students working on their master’s or doctoral degrees in deaf education or audiology supervise the children at lunch and recess, either on the CID campus or in nearby Forest Park. Beautiful scenery, walking and running paths, playing fields and state-of-the-art playgrounds are among its many attractions. CID math classes follow the same general education curriculum used by many schools in the St. Louis area. We teach math skills using a hands-on approach with concentration on critical thinking skills, language and vocabulary. Because the children are grouped by ability, our teachers can concentrate instruction to the level of each. To practice computation skills, the students use an online program called FASTT Math. 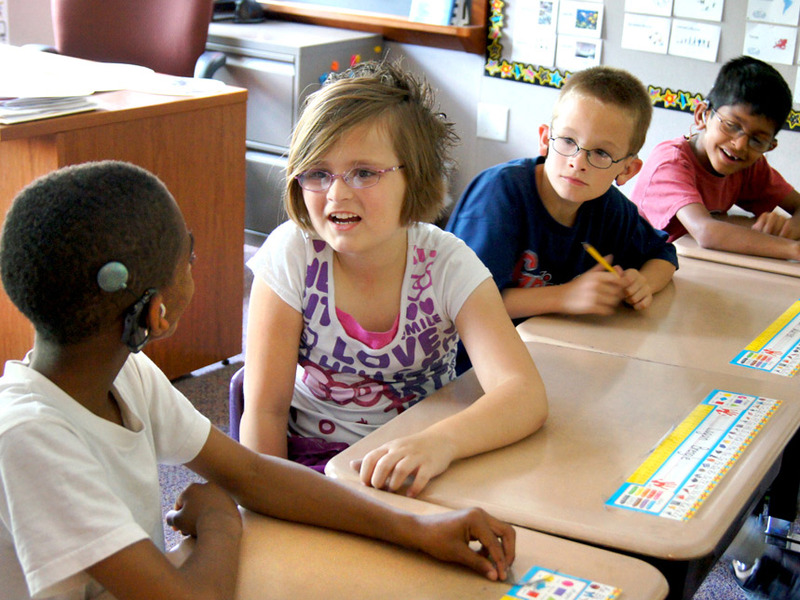 This program provides students positive feedback as they become fluent in computation facts. We introduce the students to a variety of experiences to help them learn basic science concepts and vocabulary for their grade level. Using the Discovery Education Techbook curriculum, we engulf them in textbook information, hands-on experiments, digital field trips and class projects. We give them ample opportunities to build a solid foundation in science. Children learn best by doing. In CID social studies classes, the students supplement their classroom learning by participating in real-life experiences to help them understand basic social studies concepts and vocabulary. Building a model of a neighborhood and taking a trip to the local grocery store help them learn about the world in which they live. Throughout the year, the students learn to collaborate on planning, problem solving and presenting information in a variety of ways. Projects have included art and living history museums, a trip around the world and a science center. Not only is PBL many students’ favorite activity, it prepares them for collaboration and group projects in a general education classroom. Amy Hudson, MS, CED, LSLS Cert. AvEd became coordinator of the CID Virginia J. Browning Primary School in June 2016. Ms. Hudson has been a teacher of the deaf for 26 years, working with children ages 5 to 10 at CID and at Special School District of St. Louis County, Forsyth School in Clayton and Presbyterian Ear Institute in Albuquerque, New Mexico. 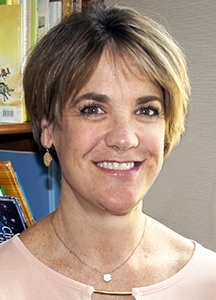 She holds a Missouri teacher of the deaf certificate (K-12), professional certification from the national Council of Education of the Deaf, as well as Listening and Spoken Language Specialist certification from the AGBell Academy.